Week 5 of the NFL regular season schedule has been completed, giving us a larger sample size to delve into just how each of the 2018 NFL Draft first-round picks has fared in their respective action so far. Some of the 32 first-rounders have not qualified for a grade either based on small snap counts or not playing altogether. On the other hand, some players have jumped out of the screen and have helped strengthen their teams. The Browns’ first overall pick put forth yet another strong showing in Week 5 and he is now the only quarterback that has graded above 80.0 in three straight games this season. Week 5 against the Ravens, Mayfield had the best deep passing performance of his young career and completed 4-of-7 deep passes (passes of at least 20 yards downfield) for 90 yards, one touchdown, and a passer rating 141.4 – the fourth-best mark among Week 5’s signal-callers. Barkley’s game-to-game production continues to be consistent even if his play-to-play production remains erratic. 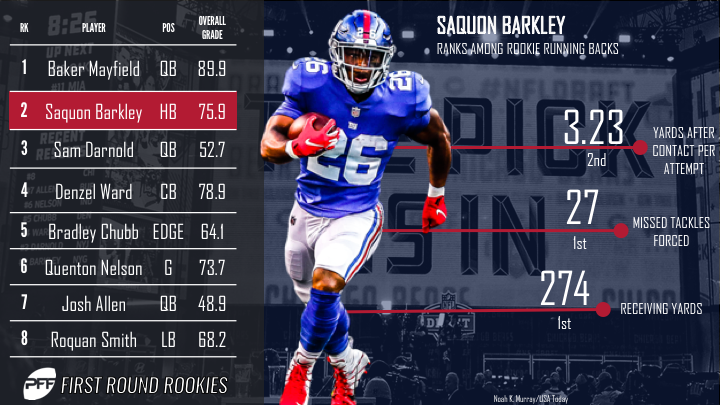 In Week 5, the second overall pick once again surpassed 100 yards from scrimmage, but 50 of those yards came on the ground via two breakaway runs (runs of 15+ yards), and another 57 yards came from a catch from a trick play pass that was thrown by wide receiver Odell Beckham Jr. No matter how they’ve come, Barkley has still racked up 274 receiving yards this year, which is the most ever recorded by a rookie running back in the first five weeks of a season. Darnold earned the highest single-game grade of his career in his Week 5 matchup against the Broncos after he completed 10 of his 22 attempts for 198 yards and three touchdowns. Like Mayfield, Sam Darnold had a career day when it came to stretching the field and completed two of his three deep passes for 111 yards, and two exquisitely thrown touchdown passes to wide receiver Robby Anderson. It was a promising performance, but it wasn’t without fault, as Darnold managed an accuracy percentage of just 60.0% when throwing from 1-19 yards downfield – the worst mark of the week. The Browns faced their fair share of criticism for taking the former Ohio State cornerback ahead of Bradley Chubb in the 2018 NFL Draft, but five games into the season, it looks like they made the correct decision. It was business as usual for Ward in Week 5 against the Ravens, and from 14 targets, he allowed just five receptions for 60 yards, logged an interception and yielded a passer rating of only 19.9 on the throws into his primary coverage. Over the last five games, Ward has allowed an average of just 0.92 yards per coverage snap, which is the best mark among first-year players at the position. After starting the season off in very strong fashion, the fifth-overall pick of the draft has simmered down a little bit over the last three weeks and has earned game grades of 47.7, 56.7 and 59.5 in Weeks 3, 4 and 5, respectively. Week 5 against the Jets, Chubb was limited to a single quarterback hurry on one of his 18 pass-rushing snaps and managed just a single stop on 23 run defense snaps.